Dr. Xiang comes from a long line of traditional Chinese medicine practitioners (TCM). Dr. Xiang graduated from Chengdu Traditional Chinese Medicine University with an O.M.D. and then began her professional career in Chongqing, China. She became renowned in the field of Chinese medicine and was appointed Vice President of the First Hospital of Chongqing Chinese Medicine School in 1986. 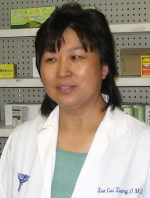 Dr. Xiang was invited to the USA as a visiting scholar and immigrated into the USA in 1989. As a pioneer in the development of Chinese medicine in the USA, in 1991 Dr. Xiang founded a clinic in Mobile, Alabama, and Pensacola, Florida. Later a clinic was opened in Fort Walton Beach, Florida. She introduced the classical Chinese medicine and acupuncture techniques for pain treatment and drug rehabilitation the the American patient. Dr. Xiang has helped thousands of patients with so-called "incurable diseases" and has won high praise from her American patients. You can read the testimonials here..